2 Bedroom, 2 Full Bath, DIRECT OCEAN & MARINA VIEWS, Sleeps 7, Free Secure WiFi! This is just 1 of 10 different Licensed Key Largo Vacation Rentals that I manager for you to choose from. So if your dates are not available for this unit, go to the HomeAway home page and type in any one of the following listing numbers in the box "Where do you want to go". 130780, 130386, 132539, 354110, 3831245, 4179084, 4328627, 4328849, 4328851. You have just discovered one of the most unique properties in the heart of Key Largo. 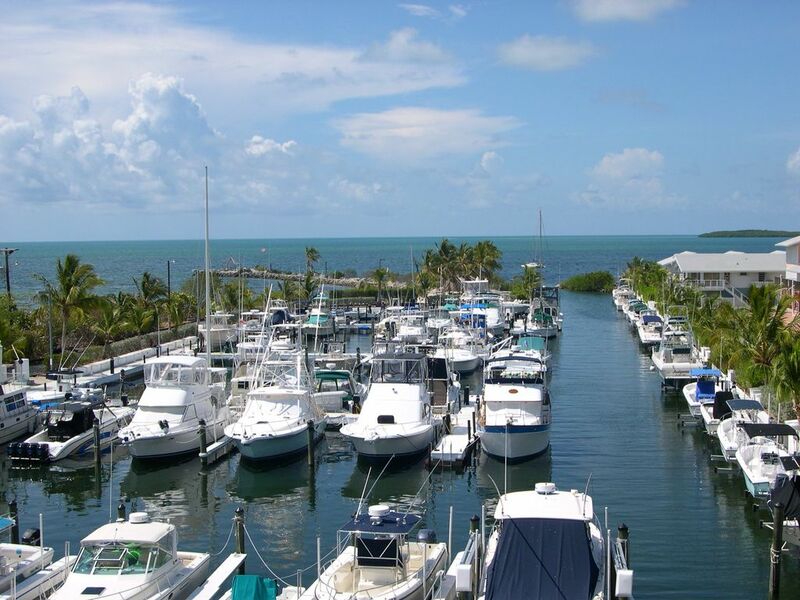 This oceanfront condo is located inside Kawama Yacht Club, a beautiful Hawaiian Island style resort that is situated along the southern border to the most popular park in all of the Keys, John Pennekamp National Underwater Park. Everything you could ever imagine to make your Florida Keys vacation complete can be found here. This 1,450 sf 4th floor condo unit offers Stunning OCEAN/MARINA/SUNSET views as well as views of the beautiful Mediterranean Style Villas (Actual Balcony View Top Left Picture). From the comfort of your own Living/ Dining/ Master Bedroom you have direct views of the beautiful Turquoise Waters and Chain of Islands the Keys are famous for. In Fall of 2015 the unit was upgraded to include: New Wood Floors throughout, Remodeled Master Bath, New Master Bedroom Furniture Set W/King Bed, New Tommy Bahamas Sofa and Love Seat, New 45" HDTV in Living Room, New 32" HDTV in master and New 32' HDTV in Guest Bedroom. Typical Day At Kawama Yacht Club: Enjoy a relaxing swim off of our private white sandy beach, BBQ with family at one of our ocean front Tiki Huts, fish for tarpon, snapper or grouper off of the 400' jetty, sunbathe at one of our swimming pools, burn off some calories on our tennis courts, take the kids over to our brand new playground or maybe snorkel in our private saltwater lagoon and swim along side the dozens of exotic fish. These are just some of the activities you and your family can enjoy. All of our guest have come away feeling that their experience here at our resort far exceeded their expectations! You and your family are just one step away from enjoying your own paradise island vacation. Winter bookings are filling fast so hurry and reserve your getaway today!! Golf Cart Available for Rent, Best Way to Get Around Resort: $20/day or $125/wk + tax. Pair of Kayaks Available for Rent, Best Way to Explore our Salt Water Lagoon: $20/day or $100/wk + tax. 100% Guarantee that the unit you see advertised is the actual vacation rental you will get. Since ALL vacation rentals in Key Largo are privately owned they are decorated and maintained based on the owners taste and budget. The range varies from new and modern to outdated and worn-down. So don't take a gamble on your vacation and insist on seeing photos of the actual rental before you book! This is a very spacious unit with Direct Ocean Views! Onsite private swimming beach with Tiki huts, coconut trees and BBQ's. 1 king, 2 doubles, 1 sleep sofa and 1 roll away bed. Gated community, 24 hour security. Brand New Marina Front Swimming Pool & Deck for the exclusive use of the 48 condo unit owners and guests. We stayed for one week. Upon arrival the condo was not cleaned well and poorly stocked with cleaning supplies and bedding (only three garbage bags, enough detergent for four loads of dishes, no extra sheets or blankets). The high cleaning fees charged made me believe we would be walking into a very well kept condo which was not the case. There were hand prints, food smudges and signs of being unkept on the walls, doors, cabinets, mirrors, windows, etc. The hide-a-bed in the living room hadn't been used or cleaned in a very long time or under the couches. This property is also quite dated. On the positive it does offer a good location and has a lot of potential but with the way it's being maintained I wouldn't recommend staying here until improvements are made. Loved all of it. Had a wonderful time. The condo was clean comfortable and the view spectacular. The property was amazing. We loved the pool areas and waterfront areas. We had an amazing time. Didn’t want to leave. We had a wonderful time at the Kawama Yacht club. There is a beautiful view from the balcony of this 4th floor unit. The living area is spacious, bedrooms comfortable and kitchen adequately equipped. The Kawama residents were friendly, mostly retired people, but some young families also. We enjoyed the pools, lagoon and walking out on the jetty. The beach and marina suffered hurricane damage and are still in need of repair, but our stay was not really affected. The pool closest to the unit is closed for repairs due to storm damage, but there are 2 other pools very close by. Our communication with the condo owner was excellent, and overall we were very pleased. This was our first VRBO experience and we would definitely do it again. Very glad to hear you enjoyed your stay and hope you come back again soon. I surprised my wife with a quick 3 night weekend getaway in Key Largo and selected this property to stay at. It was exactly as advertised, in fact the pictures do not do the views justice, everything was clean, neat and the kitchen was well equipped. I would recommend this property to anyone. The unit was large and clean, as advertised. The owner was pleasant and attentive. We loved going to sleep with open windows and listening to the ocean. However, the place is not geared for simply "hanging out," as the pool is very small and photos of the beach and facilities were flattering, to say the least. All of the following are within 2 miles of the resort: casino cruise, swim w/Dolphins, scuba, snorkeling, para sailing, boating, fishing, canoe, jet ski, restaurants, shopping. Brand new water park. Relax and have fun!! Important: This condo is licensed with the state of Florida DBPR for the purpose of short term rentals.